The Barr Brothers are from Montreal, Canada and they released their second album Sleeping Operator in October. They're back in the UK starting a run of dates this week and we caught up with them for a quick chat ahead of the tour. 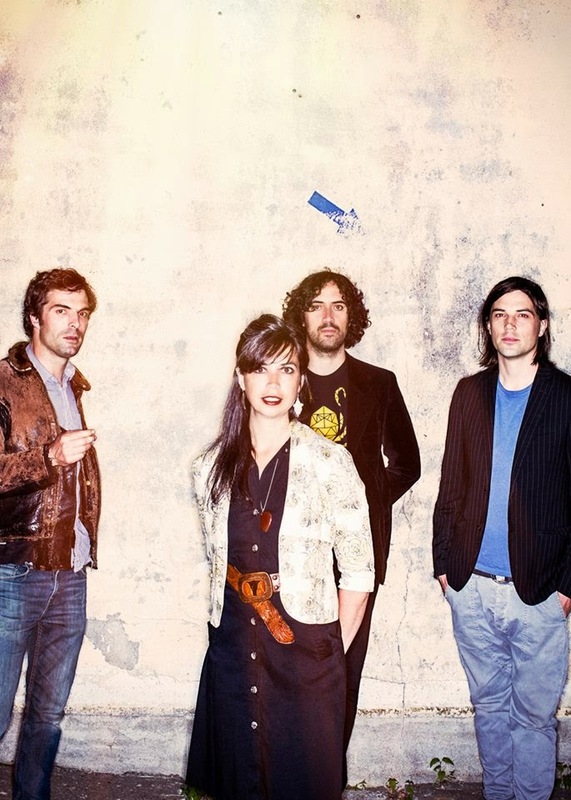 The Barr Brothers are Brad Barr, Andrew Barr, Sarah Page, Andres Vial. They formed as the Barr brothers moved to Montreal in the middle of the last decade and struck up a friendship with Sarah, a classically trained harpist who lived in the same building. Multi-instrumentalist Andres Vial joined soon after and they built up a strong following around the Montreal scene before releasing their self-titled debut album in 2011. They followed this up with Sleeping Operator in October 2014. For the uninitiated could you describe The Barr Brothers sound in a couple of sentences please? You wrote 40 songs in the sessions for Sleeping Operator, how did you go about whittling that down to the 13 that make up the album? That was definitely the hardest part of making this record, the whittling. We tried to keep it intuitive, like picking out furniture for an empty apartment. Lots of options, let's see what goes well together. Ultimately, the songs we chose for the record reflect very closely how the original sessions sounded when we put our instruments down and listened back in the control room. The songs we chose stayed very true to a band playing live in an open room. I believe that's what unites them. Are there any plans to do anything with the remainder of those songs? The tentative plan is to release them on a couple of companion EPs in the Spring and Fall. How does your songwriting process work? There’s some fairly unusual instrumentation on the record – are songs written with them in mind or are they added as the song develops? A little of both. There's always hopefully a song that presents itself regardless of the context - band, instrumentation, etc. But as I become more familiar with the possibilities and limitations of this band, I've been gravitating towards the ideas of mine that feel like they're in our bag. But it's a pretty big bag, and we are willing to try and tackle anything. And how did the guest musicians such as Richard Reed-Parry and Patrick Watson’s band get involved in the making of the record? We are very lucky to be surrounded by such a close knit and inspired group of friends and musicians here in Montreal. We are often orbiting each other, sharing gear, sharing studios, sharing bandmates, ideas etc. While we were recording and overdubbing, often friends would happen to be in the neighbourhood and drop by and we'd rope them into playing something on the record. In other cases, we reached out beforehand, knowing that a certain song called for a certain person's style of playing. In the case of Richard, we were both using various rooms at Mixart to record (he's been working on the next Little Scream record). Whenever we needed a pause from our own endeavours, we'd go listen to what each other was doing. He heard a cool upright bass part on a song, grabbed his instrument and nailed it. This is your second trip to the UK promoting Sleeping Operator. How does it feel to be playing these intimate venues and how do UK audiences differ from those back in Canada? It always feels like a field day when we set off to play the UK and Europe. I hope it always feels like that. And, to tell you the truth, we've played in a lot of different countries in lots of different kinds of rooms and though the tendency is there to try and distinguish between audiences, a good show always feels like a good show, and a bad show always feels like Ishtar. What can we expect from the live shows? Will it just be the four of you and what range of instruments will you be bringing with you? The lineup has been expanding and shifting over the last 6 months. It's one thing about starting a band in your thirties as opposed to in your twenties, people are inevitably obligated to other things later in life. We're ok with this. Sarah, Andrew and I make up the core, and we have the good fortune of getting to tour and play with some of our favourite players in a rotating cast, including Joe Grass on pedal steel, Hans Bernhardt on bass, and Andres Vial (pump organ). Given the range of instruments you use on record, how difficult is it to replicate the feel and sound of the record when you play live? What are your plans for the rest of the year once the UK tour is complete? I was hoping to organize my tape cassette collection, but looks like that will have to wait. Touring, touring, and more touring. The Barr Brothers play the following shows in the UK over the next week and a half.